Compact digital lifestyle cameras are the current trend, big in performance and at the same time boasting a miniaturized design, chic and sophisticated with a unique touch – these features are not just characteristic desires of the market, they also describe the well known company values of MINOX in product design. And what other elements could underline these values better than brilliant gold and sparkling diamonds! With this new digital camera the optical specialists from Wetzlar once again stand out from the rest, demonstrating a feeling for aesthetic detail, competence in design and diligence in their choice of the most noble materials – and without neglecting function and technical innovation. 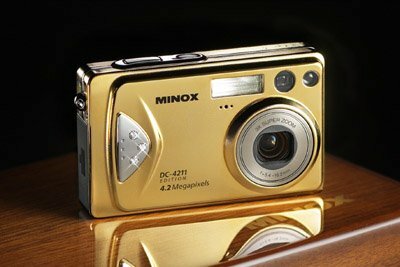 The golden DC 4211 is a treasure to put in your handbag or jacket pocket, a distinguished accessory and a highlight - in every sense of the word – in the history of MINOX GmbH. The body of this wee camera in the latest slim-line look is coated in 24-carat gold; three real 0.2 carat diamonds adorn the front of the body to create the sparkling highlight. The technical data of the camera also boast distinguished features: the 4.2 megapixel CCD sensor together with a fast MINOCTAR lens, 3 x zoom and autofocus provide dynamic images with natural color rendition and pin-sharp definition. The handling of the camera is particularly convenient thanks to the short shutter release delay, automatic white balance ensuring the right exposure and the large 2.0’’ TFT color monitor with brilliant and sharp image display. The digital USB interface enables the convenient transfer of the image files to the computer. An exclusive leather case as well as a fine wooden box belong to the scope of delivery of the MINOX DC 4211 along with wrist strap, a li-ion battery as power source, a 32 MB SD card for storage and software for image processing on a PC.